Update, 8:20 p.m. Monday: The longest Oakland strike in recent memory has been suspended and some 3,000 city employees are expected to return to work on Tuesday. SEIU Local 1021 has been on the picket line since Dec. 5 following months of failed negotiations for a new two-year contract. After the city declared an impasse last Friday, the union and city agreed to voluntary mediation, which began this week. No deal was reached as of Monday night, but union negotiators emerged from closed-door meetings saying the city has changed its position. Szykowny would not give any details on how the city might have shifted its position but instead said mediation will pick back up next week. At a press conference, City Administrator Sabrina Landreth said the two sides had "healthy dialogue" and they were able to reach agreement on some critical working conditions within the contract. 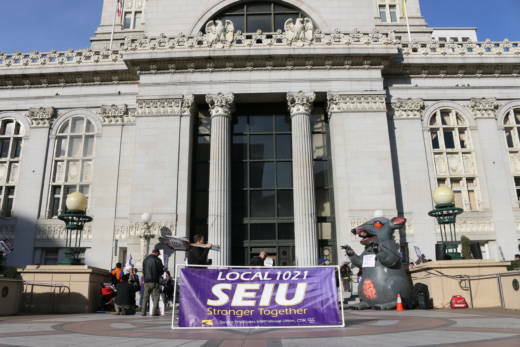 Officials for SEIU Local 1021 -- representing some 2,000 Oakland city workers -- say they’re "cautiously optimistic" that mediation talks with the city will result in an agreement. The workers' strike continues into its seventh day in what has been called one of the longest strikes in recent memory. Among other disagreements, SEIU Local 1021 wants 4 percent pay raises in each year of the two-year contract. The city has agreed to a 4 percent pay raise in the first year, but only up to 2 percent the second year, depending on city revenue. City officials warn that wage increases could lead to service cuts and layoffs, while union members argue that many workers have long commutes and a poor quality of life due to Oakland's high living costs. SEIU Local 1021 represents employees ranging from 911 operators to library, senior center and Head Start staff. About 1,000 IFPTE Local 21 workers are also on strike. The workers have been on strike since Tuesday. The two sides had been bargaining since May and the union has been working without a contract since July 1. On Thursday the city released its latest public offer, which did not include the wage increases the union wants, before declaring an impasse on Friday. Union members feel that the city didn't bargain in good faith before declaring an impasse. “Those are ultimatums. We’re still trying to bargain,” said Alice McCain, a public library employee and member of the bargaining team. On Saturday, Local 1021 agreed to mediation with the city and the union was allowed to choose the mediator, David Weinberg.